Job interview questions are constantly changing and here in the UK, 2019 is no exception. Competency based interviews are still here however more and more employers are now using Blended Interviews where they will ask a range of different interview question types all in the one session. You should also prepare for a Strengths Based Interview where they explore not only what you are good at but also what you love doing. In this article, we reveal the most common interview questions that you may be asked in any job interview in the UK in 2019. Although a few of them will seem direct, to the point and easily answerable, take heed; regardless of how benign a question seems on the surface, its purpose probably has a deeper intent. You may be tempted to give a very honest and casual response, due to the open nature of the question. However, this may work against you, as the interviewer is counting on your honesty to reveal or indicate any problems or difficulties you have had. They will explore further and you are at risk of revealing some issue or challenge which may rule you out for the job offer. It is best with these types of negative questions to give an answer which reveals a previous weakness but one which you have overcome due to training, experience or other personal development. Just to mention, these interview questions and answers are taken from the InterviewGold online interview training system. When you join, you get access to interview questions and sample answers specific to your role along with expert advice all presented in a combination of easy lessons and video tutorials. You can record and save your own answers and practice your delivery all in one easy online system. In our interview coaching practice, we work with clients in a variety of industries and at a range of levels. We also assist with recruitment in a range of sectors and we continuously gather feedback and input regarding the questions being asked. Our research for 2019 shows that the traditional big opening interview questions are still being used by many employers in the UK. They may ask 2 or 3 of them and them combine them with competency based or strengths based questions to gather a more holistic picture of you as a candidate. We suggest you prepare answers for each of these interview questions. Even if the question doesn’t come up you will have refreshed your memory and the answer can be woven into other questions to boost and enhance them. The “Tell me About Yourself” question is one of the most common questions guaranteed to come up regardless of your sector, your experience level or your job. It is universally popular and used equally by inexperienced interviewers who haven’t looked through your application before and experienced interviewers who want to get an initial overall view of you and your skills. Please talk us through your CV / Resume. Walk us through your portfolio. Tell us something about yourself that’s not on your application form. They have to start somewhere and this is a great big question which is a perfect way to start the interview. It is an open question, so you cannot answer with a simple yes or no, you must start talking. It is also possible they have not had time to review your CV, portfolio or application form in detail and this question invites you to give them a summary. As you will see below even if they ask for a CV walk through don’t do it. This is a real selling opportunity and this lesson will help you get your answer perfect. A good answer is vitally important as it can set a positive tone for the rest of the interview while a poor one can be very difficult to recover from. Most importantly your answer must have proper structure and a smooth flow that the interviewer can easily follow. They need to hear your key messages and you should deliver them succinctly and ideally within 2-3 minutes. The content needs to be strong, relevant, to the point. Use the PASS formula to structure your answer: Profile, Achievements, Skills and Sell. In terms of guidelines, avoid an answer that is personal. Many candidates make the mistake of assuming the interviewer wants to hear about their personal lives and talk about relationships, children, interests and hobbies. These are of no interest to the employer in an interview and are most likely to lead to failure. They want to hear about your work, your professional life and what you can do. Similarly, don’t just give a boring CV walkthrough. Put simply this is likely to become a boring monologue and shows a lack of communication skills and ingenuity. Even if asked ‘Talk us through your CV’ you should use the PASS formula above; you will take control of the flow you will direct the focus and you will come across as much more powerful and professional. The interviewer can then ask for further detail on any aspect. A great answer to this question can set the scene for the whole interview and have a huge impact on the outcome. Question 2: Why Have You Applied for This Job? What attracted you to the post, what was it that encouraged you to apply? Do you have a genuine interest in this position or some ulterior motive? What aspects are most important to you, what key areas first caught your eye? Do you understand what your responsibilities will be and how exactly you will fulfil them? The industry or sector the company is in, its prospects for growth and expansion, its product line and its business reputation. The actual job and the variety of duties and responsibilities associated with the position. The company’s policy regarding its employees, the overall quality of their personnel, and the advancement opportunities available. In giving your answer, be sure to place emphasis on what you would bring to the company, instead of focusing on what the company might do for you. Also, make a point to discuss the research you have conducted, as this will demonstrate that you have specifically targeted this firm as opposed to simply applying for a job. Use this portion of the interview to show that your skills match up with the specific requirements of the position. For example, if great communication skills are of paramount importance, talk about how yours can aid you in this type of company or role. And even if the compensation package and salary are appealing, do not give that as one of the reasons you are applying for the job. Your interviewing panel will be curious and what they will want to discover is just how planned is your move. They will want to know if this move is part of your career progression or a sudden change of heart. Are you rushing out the door or even being pushed out. Remember, it is always better if you can show it was the pull of the new role rather than a push away from the old one which precipitated the move. Most importantly, be sure that reason you want to leave is positive, and refrain from making any negative statements about your last company, or your superiors. Question 4: What are your strengths? This interview question offers a great opportunity for you to discuss how your professional skills are perfectly aligned with main competencies of the position. It also serves as a chance to convince the interviewer that you are the best candidate for the job. The key to delivering a great interview answer is in using the analysis of the position requirements combined with any other research you have conducted on the company. Begin by asking yourself, ‘What key qualities must I demonstrate for this role, and what specific skills is the company looking for?” Then deliver a tailor-made response. Your reply should focus on around three key attributes that are necessary and important to the position. Also, don’t hesitate to provide examples of past instances where you effectively implemented these skills to a successful outcome. In addition, in your answers you may choose to talk about your favourable personality traits such as passion, professionalism, loyalty, and dependability, as interviewers are particularly keen on these in prospective job candidates. Question 5: What do you like or dislike most about your current job? Another common interview question and worth bearing in mind there is scarcely any job out there that doesn’t contain some unpleasant aspects. However, when answering you shouldn’t mention them during the interview process. When giving an answer to an interview question such as this, we recommend avoiding any negative discussion, and instead talk about the things you like or enjoy, all while relating those duties and responsibilities to the position you are currently applying for. Should the interviewer insist on an account of your dislikes, focus on the lack of growth potential, stability, and location referred to in Question #3. Question 6: What will you bring to the role? This is a very interesting question as it challenges you to know exactly what your value is to the employer. They are asking what is it that you have that they will find useful. What are you bringing to them that is going to help them solve their problem? Here, the interviewer is in search of an enthusiastic answer that relates to Capability, Commitment and Compatibility. Take this as an opportunity to really demonstrate how your past accomplishments and current skill set make you the perfect candidate to hire. Also, use examples of your prior achievements to make the point that you will fit in seamlessly, and be a valued and committed employee. 1. Analyse the job description and person specification: Highlight the skills and experience required by the company. Compare this list with your abilities and expertise. 2. Understand the employer: Gather information and understand what they are looking for. What skills do they value, what experience will they look for. 3. Choose three core requirements: List three top requirements as detailed on the job description or person specification. Choose those which are both listed as essential which you excel in and are fully confident with. This will form the basis for your answer. 4. Bring proper structure: Your interview is a communication exercise and you must structure and deliver it professionally. 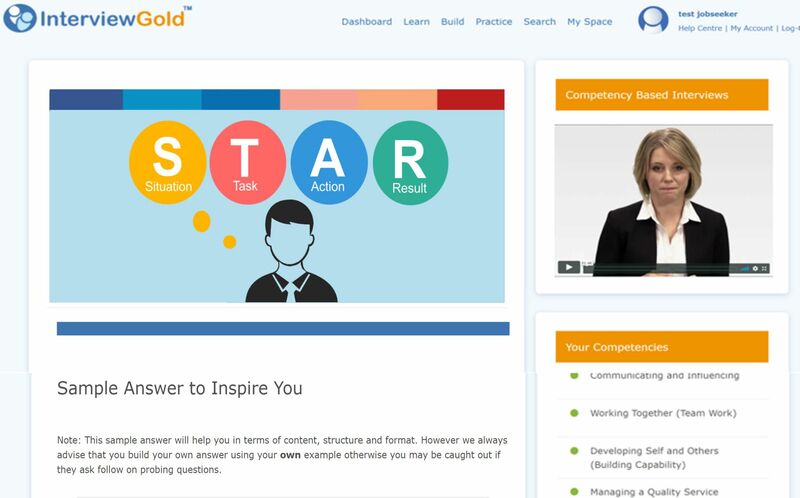 We include a range of formulas in the InterviewGold online training system however for this we suggest you use the ABC Formula and the Rule of 3 to structure perfectly. 5. Be confident: When answering be sure to exude confidence, self-assurance and determination, as the fact that you made it to the interview process means they are building a case to hire you, and not disqualify you. Remember to focus on the job description and refer to it when the discussion turns to how your competencies, skills, and abilities fit those particular requirements. 6. Transferable Skills: During the interview, you will want to place particular emphasis on how you wish to contribute to the company. If you are transitioning between dissimilar sectors or industries, be sure to make liberal use of the phrase ‘transferable skills’ in your answers. These are the abilities and traits that all company’s place great value on, and include great verbal and written communication skills, focus, time management, teamwork, being task-oriented, and accountability. Discover how to answer any interview question with 100% confidence. Question 7: Why Have You Chosen This Career? Simply put, the interviewers want to know what first attracted you to your career. They hope to understand the motives and reasons and whether you made an early positive choice or you somehow drifted into it. A good answer is one which shows a positive choice and one where you recognised your talents and the types of careers these best fit. Refresh your memory, think back and come up with a list of factors that prompted you to this choice. Focus on experiences which gave you a positive impression, for example, this can be a successful internship, which confirmed your desire to work in this field. Or maybe you followed in the footsteps of someone you know. You admired how they dedicated their life to this career how inspired and excited they were about their choice and how you decided from an early age to pursue the same path. This can work also for famous representatives of the profession, who inspired you to choose this field. It is great if you can refer to your achievements in school or college especially where the subjects studied are associated with the desired job. You can even mention the results of vocational guidance, personality testing or other career aids which have shown your suitability for the work and helped support your choice. Question 8: What are your long term career plans? Question 9: Where do you see yourself in 5 years time? I have combined these two questions simply because they are effectively asking the same thing. These questions are exploring motivation and intention and the interviewer is trying to find out how long you will stay with this post should you be offered it. In addition, they want to see how clearly you have though out your career plan or indeed if you have one. If you have selected this role carefully and see it and the employer as a core part of your future working life, then you are more likely to stay with the role and organisation. So how do you deal with the question? Firstly, reassure the interviewer that you see your career in this Sector doing this type of work; after all this is what you excel at. Mention how this employer is top of your list and how you can see yourself settling onto a long term career with then, continuously delivering top quality work, growing with the organisation and enjoying the challenges that come along. While it’s impossible to predict the future and indeed you might move again in six months, your answer should simply give the interviewer confidence in your intentions. and if you do intend leaving after as short time best not to mention that as you are unlikely to get offered the role. Question 10. Do you have any questions for us? This is probably the most frequently asked interview question. It comes at the end of pretty much every job interview and gives you an opportunity to find out more about the job. Find out more about the duties and tasks, what the employer wants to do in the first six months, to whom you will be reporting and how many others in the team. You can explore more about the company and its plans or indeed the strength of its balance sheet. A word of caution; try to avoid asking questions where the information has already been given either during the interview or in the pre-interview documents. Similarly, if the answers are very obviously on the company website try not to ask as this shows your research has not been very in depth. Finally, don’t ask about salary and benefits; there will be plenty of time for this when you have been offered the job. Are you struggling with job interviews? Getting tongue tied, going blank and unsure how to answer correctly? Perhaps you are doing ok in the interview room but just not getting jobs? Whatever your situation, preparation is vital and to be more precise the ‘right’ preparation is key. 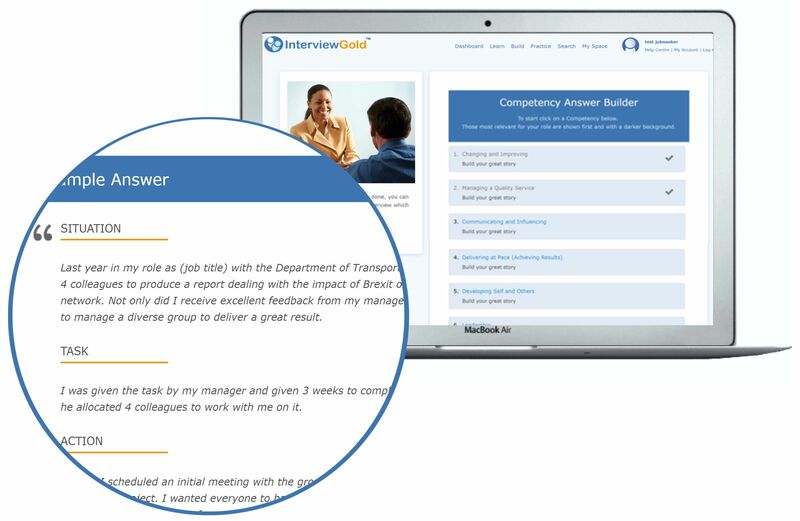 With the InterviewGold online interview training system your interview preparation is done for you and you have access to a comprehensive database of interview questions with answers. Best of all, accessing those most relevant to you is easy; just select your job and level and it will show you those most likely to arise in your actual interview. Use these expert answer guides to win the job offer in your very next interview; after all thousands of other job seekers have done just that using the system.